The nation’s biggest college sports program just paid its new director $6 million to quit. The University of Texas’s Steve Patterson, an athletic director so reviled he managed to unite the contempt of football-loving alums and sports-reforming faculty, is no longer running the nation’s most lucrative athletic department. After “a brutal 22 months” at the helm, Patterson is done. The man who went from running the NBA’s Portland Trailblazers to trying to turn the burnt orange of Texas into a “global brand” committed the greatest sin of all. It’s not that he enraged professors by openly disrespecting the importance of their classes for “his players,” jacked up ticket prices, and executed embarrassing gaffes like trying to charge alumni at their 50th anniversary $25 a head just to stand on the football field. It’s that he did this while being unable to turn around a college football program that has experienced a stunning fall from grace. 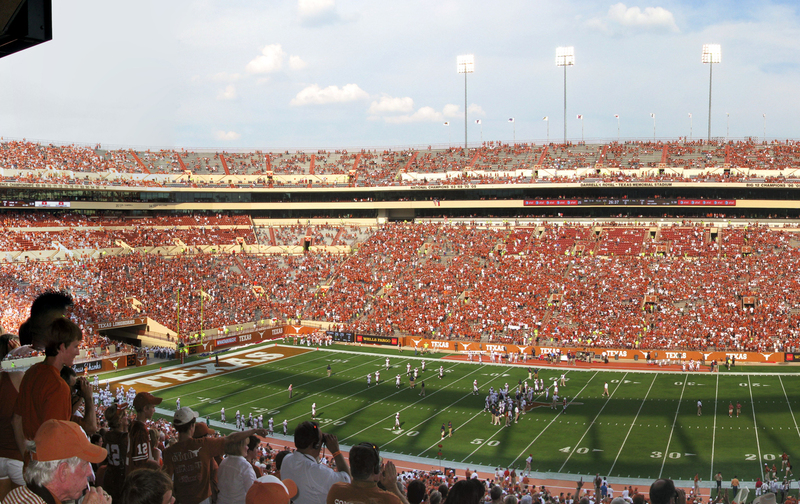 As ESPN tweeted, “Texas Longhorns Football: 2000-2009: 110-19 (.853); 2nd best win pct in FBS. 2010-pres: 37-29 (.561); 54th best win pct in FBS.” Last weekend, they almost lost to sad-sack Rice University as a plane flew over the stadium trailing a banner calling for Patterson’s ouster. Yet while the AD is gone, it did not come without a price: A wide array of reports put the buyout of his multi-year contract as ranging from at $5.6 million to “at least $6 million through Aug. 31, 2019.” Over $6 million to simply go away. Numerous sources have said to me that Patterson was so disliked that the sum has been promised to be paid off through donations by well-heeled alums and boosters. The difference, however, between this payout to Steve Patterson and stadium spending is that as venal as public arena financing is, it speaks to a real economic agenda; the idea that corporate welfare is actually good for a city’s economy. (It’s not.) In other words, it may be the economic logic of the 1 percent, but at least it is a logic. (Or, in “Big Lebowski” terms: Say what you will about the evils of public funding for stadiums. At least it has an ethos.) This payout to Steve Patterson may liberate the athletic department from his clutches, but it reveals a set of priorities which are absurd in the extreme. I know we are all a bit jaded when it comes to money in sports. But $6 million is an obscene amount to give an AD for walking away. It also comes on top of Patterson making the decision to pay millions of dollars to fire football coach Mack Brown and men’s hoops coach Rick Barnes. It’s a circle jerk of dead money sacrificed at the altar of collegiate sports. In a decent world, these alums would raise the same amount of money, dollar for dollar, to go toward paying down the crushing student debt faced by students at large. If Steve Patterson had a shred of shame, he’d donate a portion of this payout toward that very purpose. Instead, he sent out a statement thanking the community for “this opportunity to serve.” He finished with the campus sports slogan, “Hook ’em.” He certainly did. Former Texas All-American Emmanuel Acho looked at the payout and tweeted, “So #Texas will pay the athletic director 5.6 million to fire him, but the athletes can’t get paid? ?” These kinds of obvious outrages are of course not exclusive to Austin. It’s just, as they say, bigger in Texas. This proud institution gives us merely the latest example of how blaring the hypocrisy has become. But the self-satisfaction of seeing this isn’t good enough anymore. Not when athletes live in a state of exploitation as part campus gods, part chattel, and not when a mass of students are put in a state of eternal debt thanks to Student Loans, Inc. But hey, at least Steve Patterson is gone, and a lot of faculty serious about reforming this system and getting campuses out of the business of athletic indentured servitude are feeling good. Sometimes you also have to take what you get.